"We Love to Ride and Have Fun!" In 2019 some rules have changed for our rides due to insurance and other factors. Essentially, only the rides found on this site are "Official HOG Rides"
2. You must sign in and sign all the appropriate release forms for you and your passenger. 5. If you think you have a great trip in mind, talk to the Head Road Captain, Jim Hamilton to see if we can make it an official ride. 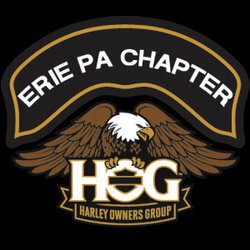 We have been asked to join the Rubber City HOG Chapter from Akron, OH on Jun 7, 2019. Tentatively they are arriving at our dealership around noon on their way to Niagara Falls, and we will join them for a light lunch. They hope that we can ride with them around the Peninsula, then onward towards Niagara Falls via RT 5. Since this is the same day as our scheduled Lucky 7 ride, we will determine where we will break off with them and continue on to our destination. Further details will follow.